Everyone has suffered from that incredibly itchy bite that keeps you awake at night. Although some people seem far more susceptible to being bitten and suffer spectacular reactions; it is a fact of summer that we will all get nibbled by something and it won’t be pleasant! 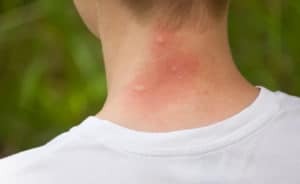 This guide gives you a general overview as to what might have got you and suggestions as to the best way to treat the bites and stings to make them more bearable and less of an ordeal. First point – no matter how tempting it is, please don’t scratch the bite. Once the skin has been broken the bite is far more likely to become infected. The first sign your bite is becoming infected is likely to be that it gets redder, hot and more itchy. 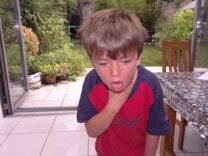 If this is the case get it seen by a health professional as soon as possible. If the redness tracks away from the bite and spreads across the skin, this could be a sign of cellulitis, which is serious and you should get medical treatment quickly. Anyone can react to a sting, it is most commonly a local reaction, just affecting the bite or sting itself. If the person who has been stung experiences a local reaction, apply a wrapped ice pack to the affected area and this will help to reduce the swelling and can reduce pain as well. Antihistamines will also help reduce the reaction and will treat itching and swelling, take paracetamol or ibuprofen to reduce pain. If they are struggling to breathe, they should be encouraged to sit in an upright position, putting something under their knees to help increase their circulation can be helpful – into the lazy W position. If they are not having trouble breathing, but are feeling weak, dizzy, sick and thirsty – and showing signs of shock should lie down with their legs raised to help increase the circulation to their vital organs. They should stay lying down even if they appear to recover, as sitting or standing them up could cause a further drop in their blood pressure. Encourage them to turn their head to one side if they are likely to vomit. They should be covered to keep them warm and kept in this position until the paramedics arrive. 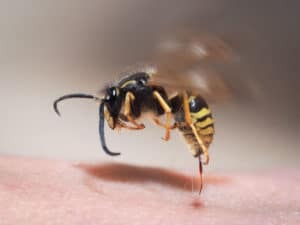 Bees and wasps are not generally aggressive and don’t look to sting people, however it is extremely common for people to accidentally step on them in bare feet, or for them to fly into us and then sting. When bees or wasps sting a person, they inject venom through their stinger into the skin of the victim. Wasps, hornets and other stinging insects have stingers without barbs that they retract when they sting, so these insects can sting people multiple times. Bees have a barbed stinger that they leave in the victim’s skin along with the venom sack. If someone is stung by a bee and the sting remains in the skin, quickly flick it out using your thumb nail or a credit card. Try not to squeeze the sting as this can increase the amount of allergen entering the body and therefore increase any possible allergic reaction. The venom sac can take 2-3 minutes to release the venom and so removing the sac promptly can prevent further venom increasing the reaction. Most people only experience a localised reaction to bee stings where the localised area around the skin is inflamed, red and painful. About 3% of people stung by bees and wasps have an allergic reaction to the sting, and up to 0.8% of bee sting victims experience the severe and life-threatening allergic reaction known as anaphylaxis – this requires urgent medical intervention as detailed above. Old wives’ tales suggest neutralising stings with vinegar or bicarbonate of soda (depending on the source) is an effective remedy for wasp and bee stings. Wasp sting venom is more alkaline and the remedy is neutralising the sting with vinegar to reduce the pain. Bee sting venom is predominantly formic acidic and so they advise this should be neutralised with bicarbonate of soda. Neither of these remedies have any scientific backing and it is more likely to be the power of suggestion than any real benefit that might make people feel better. Ticks are tiny creatures that live in woodland and grassy areas, they are particularly prevalent if there are deer and other wildlife. They are blood sucking and bite into the skin to feed on blood. Initially they are extremely small, but swell as they eat, eventually becoming pea sized and therefore easier to spot and remove. Ticks can carry Lyme disease (which is serious to humans) and they should ideally be removed by a health professional. If this is not possible, they should be very carefully removed with tweezers or ideally with a proper tick remover, gently pulling without twisting in any way. when using a tick remover, you should insert under the tick and rotate 360 degrees. 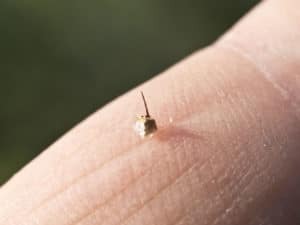 It is possible for the tick to be only half removed, leaving its mouth parts in the skin and this can lead to infection, ultimately requiring medical treatment and possibly antibiotics. Never burn the tick off or try and use chemicals to kill it. Keep the tick in a container to show to the medical professionals so they can ensure has been removed entirely. Cover up with long trousers and socks when walking in woodland and long grass and always check yourself, your clothes and your dog for ticks on your return. Lyme disease is a serious illness in humans, characterised by flu like symptoms, lethargy and aches and pains. 50% of people with Lyme disease develop a classic bulls eye type rash, which can appear on any part of the body and not necessarily where they were bitten. If you are worried you might have contracted Lyme disease, visit your doctor urgently. If Lyme Disease is diagnosed and treated quickly it is possible to make a full recovery, however it can cause paralysis, arthritis, meningitis and severe long-term problems. Chiggers are horrible little mites that are commonly found on meadows, golf courses, woodlands, parks and in grassland around lakes and rivers. They are members if the Trombiculidae family and are tiny mite like spiders. They are often known as berry bugs, red bugs or harvest mites. Symptoms of chigger bites include intense itching, and flat or raised red bumps on the skin that sometimes appear blistered. Antihistamines and topical anti bite and sting relief creams. My children also love the click-it itch relief clickers and swear they work brilliantly. Chiggers most commonly bite areas of thinned skin such as wrinkles and warm folds of skin such as the crotch and groin areas, armpits, and behind the knees. The ankles and calves are also common sites for chigger bites. When the chigger bites, it inserts its feeding structures and mouth parts into the skin. They inject enzymes into the host skin that destroy the tissue around the bite and it is these that frequently provoke reactions. The area around the bite then hardens, and they insert a feeding tube, called a sylostome, further into the bite area. If chiggers are not disturbed, they can feed on the skin through this structure for a few days if they are not disturbed. Most of us are familiar with the tell-tale buzz of the mosquito and well aware of the look of these pesky vampires. We do get them in the UK and our increasingly warm summers are leading to a surge in numbers. Mosquitos are flies that feed on human blood, they are also carriers of malaria, dengue fever, Japanese encephalitis and many more extremely serious diseases. Mosquitos love stagnant water and breed prolifically when the conditions are right. 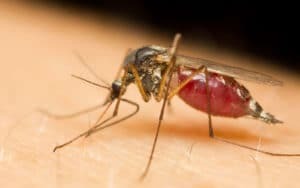 Only female mosquitos bite humans as females need blood in their diet to reproduce. Male mosquitos have feathery antennae that help them sense the presence of female mosquitos – males only live for about a week. Females have less bushy antennae and can live for a few months. Female mosquitos have long, tubular mouthparts that they use to pierce your skin and feed on your blood. When they bite you, they inject saliva into your body while suctioning your blood. Mosquito saliva contains proteins that most people react to causing an inflamed red and itchy bump. They sniff their victims out and choose them based on their scent. Many mosquito repellents try to change our smell to make us less appetising to the mosquitoes. You can get patches and sprays and people also say eating large amounts of Marmite can make you less appealing to the bugs. Ideally use a high quality, insect repellent and cover up with loose fitting, long sleeved clothes and long trousers. Some mosquitos are around more in the daytime, some at dawn and dusk. Deet based insect repellents are widely seen as the most effective. Mosquito bites, should be washed with soap and warm water. Antihistamine tablets and topical creams, anti-itch creams and applying an ice pack to the bites should provide relief from itching. Avoid scratching the bites. 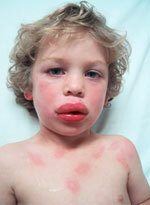 It is rare for anyone to have a severe allergic or anaphylactic reaction to a mosquito bite. Therefore, if you develop aching, headaches, or fever after getting bitten, contact your doctor. These are more likely to be symptoms of a mosquito-borne disease. Fleas are minute, irritating insects, that like to feed on our blood and that of our pets. They are a real nuisance and their bites are itchy and sometimes painful. Getting rid of fleas is hard and often requires professional pest control treatment for total eradication. Pet owners are most at risk of flea infestations, but it is possible to have fleas in your home without pets. Fleas are tiny jumping bugs, that are extremely fast breeders. Fleabites are distinctive small, red bumps with a red “halo” around the bite centre. Bites usually occur in groups of three or four, or in a straight line. 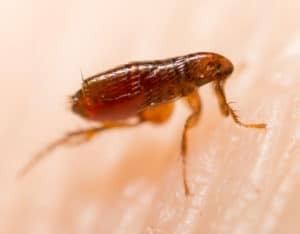 Fleas are attracted to warm moist areas such as the waist, armpits, breasts, groin, or in the folds of the elbows and knees, but they also nibble the easy to reach areas such as ankles and calves. 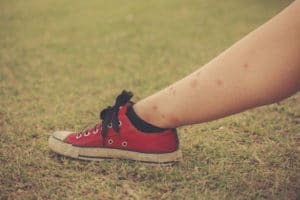 Fleabites are incredibly itchy, the skin around each bite often becomes sore or painful and you might develop a rash or hives near the site of a bite. Scratching the bites is very likely to lead to infection. This is not a comprehensive guide to bites and stings. If you experience any unusual reactions or issues following a bite or sting, please seek medical advice. Wishing you a safe and happy bite and sting free summer!